We invite you to explore India - the Land with infinite beauty ! Whether you soar high into Himalayas or peer under the ruins of the Ancient monuments dotting the landscape of India, you will cherish the experience long after your visit ! This India Travel Guide on Sharavathi Wildlife Sanctuary is free from any commercial interest! This site is dedicated to promote India - the vast subcontinent, its glorious past, magnificent landscape and its infinite variety. The enchanting beauty of the Jog Falls (highest waterfall in India) and the pristine Sharavathi River nourishes the Sharavathi wildlife sanctuary. The sanctuary is located in Shimoga district in Sagar. 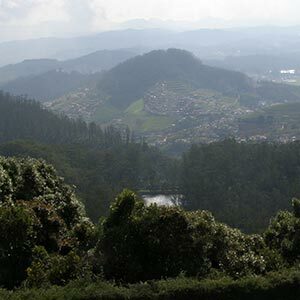 The Sanctuary covers the Sharavathi Valley region near the Western border of Karnataka and is contiguous with the Mookambika Sanctuary. The sanctuary has evergreen, semi-green and moist deciduous forest cover and is spread over a sprawling 431 km area. A part of Sharavathi River basin was declared as a wildlife sanctuary in 1972. The Sharavati Sanctuary has been divided into the core, buffer and tourist zones. A variety of mammals, reptiles and birds have adopted this sanctuary as their home. The endangered lion-tailed macaque can be found here. Tiger, Black Panther, sloth bear, jackal, spotted deer, sambar, mouse deer, barking deer, common langur, Malabar giant squirrel, wild pig, wild dog, giant flying squirrel, porcupine, pangolin and otter are common finds here. You can also spot varieties of reptiles, birds and butterflies. You can pick some local produce such as dhoop sticks, gum, honey, soap nuts, fruits, spices, medicines and bamboo. There are plenty of rare birds that can be seen here. Indian Moorhen, Purple Moorhen, Red-wattled Lapwing, Blue Rock Pigeon, bronze-winged Jacana and black-winged Stilt can be spotted in this sanctuary. The sanctuary is open throughout the year. However the best season to visit would be between November and May. You can look for accommodation at Muppane or Shimoga. The nearest airport is Hubli, about 165 km from Shimoga. Shimoga is well-connected by rail and road. You can also travel from Mangalore (200 km) and Bangalore (274 km). There are plenty of Karnataka Transport Corporation buses plying in the region. The entire route is picturesque and makes for a pleasurable drive. Nature lovers and wildlife enthusiasts should not miss visiting Honnemaradu on the backwaters of the River Sharavati. A haven for water sports enthusiasts, the place offers a break from the routine in the lush greenery of the Western Ghats. You can also visit the Ramachandrapura Math on the banks of the Sharavathi River. Other places of interest in the area are the waterfalls - Gudanagundi, Belligundi, Dabbe, Bhimeshwara. Trek to Meghane, the highest peak in the Sharavathi Valley and take in the scenic mountains and the sea. You can start your trekking trails from Karni and walk along the Belligundi stream and reach Padubeedu. From here, you can walk down to the Belligundi Falls and back. Bird lovers can detour to the Malenaadu region in Shimoga district and visit the Mandagadde Bird Sanctuary. The collection of migratory birds is a sight to watch. The median egret, darter and cormorant are seen aplenty around August.